Stream today’s “UFC 118: Edgar vs. Penn 2″ pre-fight press conference live right here on 5thRound.com starting at 3PM ET/Noon PT. UFC president Dana White, headliners Frankie Edgar and BJ Penn, as well as Randy Couture, James Toney, Kenny Florian and Gray Maynard are all expected to appear at Wednesday’s presser. Fans in the Beantown area are invited to attend today’s festivities, which takes place at Boston’s historic Great Hall in Faneuil Hall. UFC 118 will be jumping off this Saturday inside TD Garden in Massachusetts. 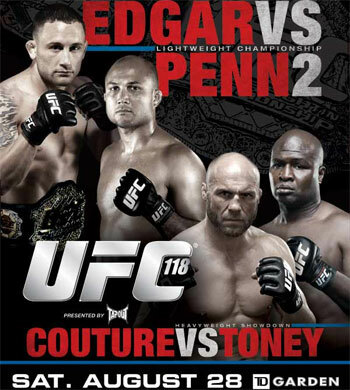 The card will feature the lightweight rematch between champ Frankie Edgar and former title holder BJ Penn. Here is the finalized roster for Saturday’s extravaganza.